With its richly-appointed, roomy interior featuring a premium 6-speaker audio system and heated, leather-faced bucket seats, the FIAT® 500L Lounge offers a standing invitation to stretch out and enjoy the ride. Its profile is an instant classic, accented with chrome body-side moulding inserts and exterior mirrors. Plus, integrated technology like the ParkView®Rear Back-up Camera14 comes standard. Make a bold statement with your choice of roof options. Reflect your style with 3 choices – body colour, Nero (Black) or Bianco (White) for a solid or two-tone look. An available generous dual-pane panoramic sunroof creates a spacious feel as well as a scenic view. The FIAT® 500L brings FIAT appeal to a 5-passenger, 4-door vehicle, from the iconic front fascia and honeycomb grille to the distinctive square-in-circle tail lamps. Its wide stance is accented with flared wheel arches, chrome door handles, and side mouldings in body colour or chrome. Stretch out and get comfortable in the spacious and versatile FIAT® 500L. There's room for 5 as well as flexible storage thanks to the innovative 60/40 split-folding rear seats with Tilt, Tumble & Slide. With its glass A and D pillars, the roof seems like it’s floating, giving you a nearly 360-degree panoramic view to take in the sights. Keep your hands on the wheel and your eyes on the road with hands-free communication13. The standard Uconnect® 5.0 multimedia centre features a 5-inch touchscreen and hands-free communication13 with Bluetooth® streaming audio for easy use. Choose the available Uconnect 6.5A for a larger, 6.5-inch touchscreen. A 6-speaker audio system is also standard, with a studio-quality, 368-watt BeatsAudioTM premium sound system available for the ultimate audiophile experience. 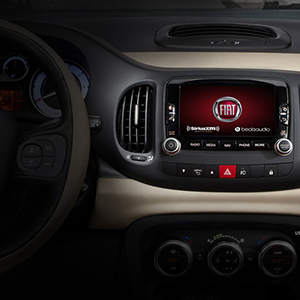 The FIAT® 500L is inspired by a timeless design and powered by the latest automotive technology. The award-winning MultiAir® engine uses an electronically controlled hydraulic system to regulate the engine’s intake valves, maximizing efficiency with every stroke. It’s also turbocharged for full 160 horsepower performance with 184 lb-ft of torque. 6-speed automatic is available on Sport, Trekking and Lounge. 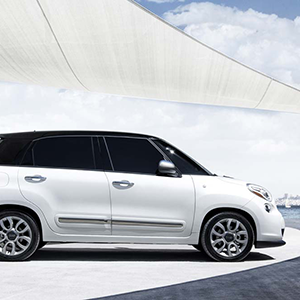 Either way, you're getting the all-out driving fun that's the hallmark of the FIAT® 500L family. eco:DriveTM is an ingenious way to improve how efficiently you drive. Transfer information about your driving style from your FIAT® 500L to a computer with a USB drive or a smartphone via Bluetooth®. The eco:Drive app analyzes your driving style and gives you tips on how to use less fuel and reduce carbon dioxide emissions. This feature is available only with Uconnect® 5.0. The FIAT® 500L is engineered to be one of the safest vehicles in its class. That's why every model comes standard with 7 air bags6, Electronic Stability Control7, 4-wheel disc antilock brakes with Brake Assist, reactive front head restraints15, tire pressure monitoring and more. Prevention is an important part of keeping you and your passengers safe. That’s why Electronic Stability Control, All Speed Traction Control and Hill Start Assist are all standard on the FIAT® 500L. There's no substitute for cautious, attentive driving – but wherever you go, the advanced safety technology in the FIAT 500L gives you added peace of mind on every drive. Two innovative available safety features keep you safe when you’re going backwards. The ParkView® Rear Back-up Camera14 activates automatically when you shift into Reverse, giving you a clear view of what’s behind your vehicle on the centre touchscreen. The Park-Sense® Rear Park Assist system14 makes reversing a breeze, thanks to an audible warning when it detects an obstacle in your path at parking speeds that increases in frequency as you get closer. Every FIAT® 500L comes with standard 4-wheel disc antilock brakes to help improve steering control and prevent wheel lockup in extreme braking situations. It also features Brake Assist, which applies optimum brake pressure when it detects an emergency braking situations to reduce stopping distances. The standard tire pressure monitoring system displays the real-time air pressures of each individual tire. This way you can always be sure each tire is correctly inflated and performing optimally at all times. TAKE THE 2016 FIAT 500L LOUNGE FOR A SPIN!